Get ready for summer with my all new 4 WEEK CLEAN EATING & WORKOUT GUIDES! Get everything you need to reach your goals for just $40! 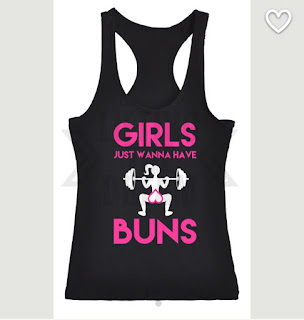 EMAIL girlsjustwannahavebuns@yahoo.com to get your guides sent to you today!!! 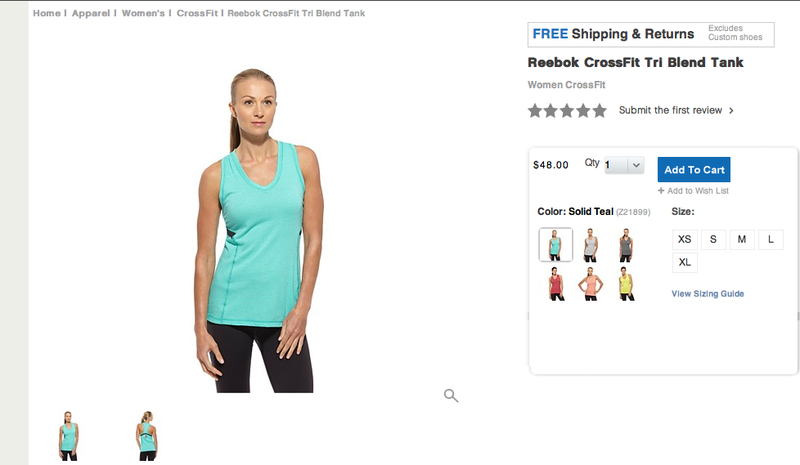 When I got pregnant with my first baby, I figured I'd probably never do fitness modeling again. How would I get back into photo shoot shape? How would I have time? Who would want a mom to model for them? You know, all those worries we have as mamas. Well, I was wrong. It took about a year, but then I was back at it! In fact, my first job was modeling a new swimwear line! Scary, but a success. Then, I got pregnant with our second baby... and right at the same time, I had signed on with Icon Fitness to develop and host my own workout videos called Fit in 15! Luckily, we were able to shoot them all before my belly showed. Instead of stopping there, we decided to take advantage of the belly... and I created Fit Mommies. Flash forward two WEEKS after having Joyah... yes, two WEEKS later, I got my first job after baby 2. I couldn't beleive it! I certainly wasn't in tip-top shape, but I had managed to lose most of the pregnancy weight (since I worked out and ate healthy the entire pregnancy, I only gained 17lbs). Here's my favorite shot... Luckily no sports bras were involved haha! Baby girl came with me! 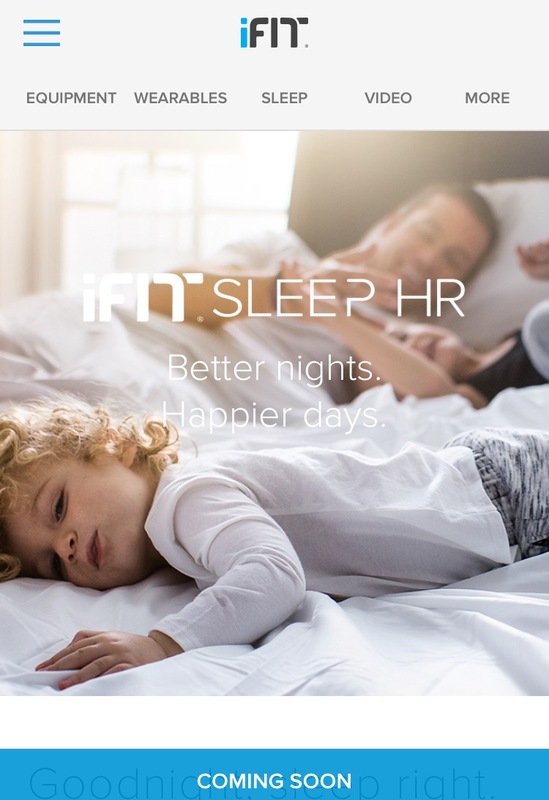 A few months ago my family got the opportunity to do a shoot together for the new iFit Sleep sensor. It was a blast! It was Tilman's first paid gig! He did amazing! So, why am I sharing this? Well, I know that as moms, we tend to lose ourselves. We focus all of our time and attention on the kids. We skip workouts, ditch the makeup, eat scraps that the kids leave behind (3 goldfish, 1/4th banana, 1 carrot & whatever that crumb was on the floor ;-)... that counts as lunch right?) Being a parent is so self-less... but it's also a huge motivator to be in the best shape that you can be! Set good examples for your kids by working out, making healthy meals and practicing self-control and discipline. You can absolutely lose the baby weight! You can still take time to make yourself and your family a balanced meal, you can even put on a dab of masacra! I've found that balance is the KEY... and that's why I'm sharing my 15 minute workouts with you all (follow me FITELYSE on Instagram)... we all can manage 15 minutes! You deserve 15 minutes to focus on you, get back into shape and accomplish things you didn't think you'd ever do again! If you're not following me on IG yet, do it now! Like right now. ;-) I've been posting daily workouts you can do right in your living room without any equipment! As a stay at home mom who dabbles in a lot of other things (fitness modeling, personal training, weather anchoring, nutrition) I understand how tough it is to get in a good workout! Time is limited, but that's no excuse. My babies are my workout partners almost every day... I use them as weights (it's fun for them too)- I have my son do exercises with me, he chases me up and down the stairs with dinos... and sometimes they just hang out while I work around them. But they are NEVER an excuse not to workout. In fact, in the morning, my son usually asks me "has mama done her exercises, yet?". On days when I'm not feeling it, I just think of that sweet voice and dig deep. I want to be healthy, fit, strong & happy for those two precious kids. BUT... of course I don't want to ignore them (mom guilt!! ), so my 15 minute workouts are PERFECT!! I get in a great sweat & major muscle burn without putting off my duties (lego building, fort designing & dino watching). There's no excuse! Anyone can do a 15 minute workout! Follow me on IG for more!!! Ok, we are 7 days into the new year.. Have you broken your "get fit" resolution yet? Have you even started it? I bet you just don't have time, right? You're way too busy, you'll start next week..next month.. next year. No way! We ALL have time... especially when my workouts only take 15 minutes!!! Wake up a little early, go to bed 15 minutes later, squeeze it in on your lunch break.. Just do it! My "Fit in 15" workouts are not only short... just 15 minutes (seriously) but they are killer! CLICK HERE TO GET "FIT IN 15"
I'm in LOVE with this new product I recently came across...Wee Sprout Reusable Food Pouches! If you're a follower, you know how passionate I am about making my own ORGANIC baby food. I made all of my son's baby food (he's now 2 1/2) and now that my baby girl is eating solids, I'm busy steaming, blending & feeding her homemade yummies, too! My toddler is such a healthy eater - he loves salmon, beets, coconut oil instead of butter, spinach applesauce and won't eat brownies, fried food or pizza. Maybe he's odd (haha) OR perhaps it's thanks to all the fresh food I fed him as an infant and continue to feed him. I'll take credit and say my hard work paid off ;-)... so I'll do it again with baby girl. With these pouches, all you do is make the food and then fill them up through the double zipper bottom, zip closed and feed. No spoons or bowls needed - no extra dishes to clean...YAY! Then simply rinse out and reuse or put in the dishwasher. You can also make big batches ahead of time and freeze these (which is what we did for a recent vacation). You just put the blended food in the tray, freeze and then pop out one or two cubes when you're ready for them, place in pouch, defrost (or bring along in the diaper bag for later) and eat. For months my family has been loving replacing carbs with veggie varieties - cauliflower for rice and mash, zucchini for noodles, zucchini as fries, etc. But now... oh the possibilities!! In the first few days I have already made zucchini noodles, beet noodles and sweet potato noodles - all AMAZING!! 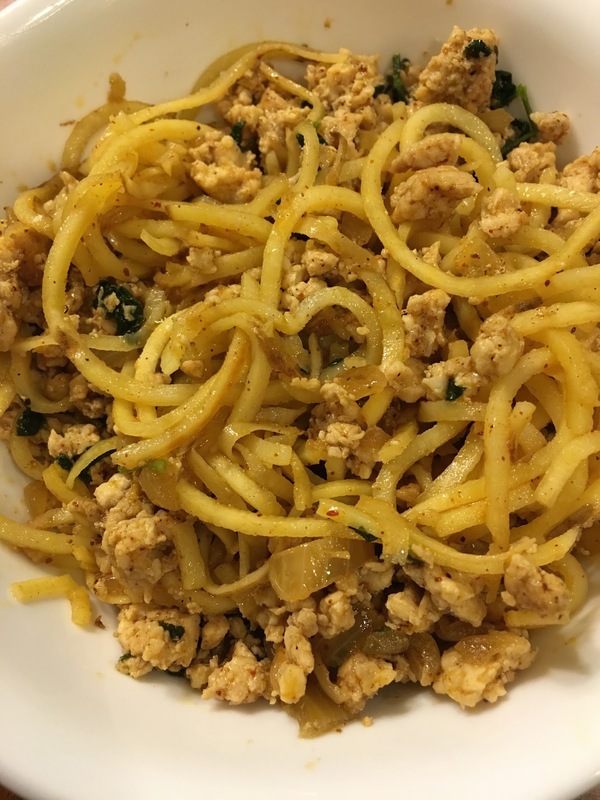 I paired the sweet potato noodles with cilantro chili chicken and wow wow... The flavor profile was on fleek (Ok, I'm totally trying to be Food Network-ish and hip with that last statement. The fact that I just used "hip" shows you that I'm a nerd LOL). Ok, this meal is a must! TRY it!! You'll love it!! Saute onion w/ oil. Add chicken and seasonings. Cook through. Add cilantro and "noodles". Cook on medium for 5-8 minutes until potato noodles are the texture you like (best with a little crunch). Cuddling my baby boy... and getting paid for it! Score! The busy holiday season is upon us... I know, I know... You don't have time to workout, right? So, you'll just pack on the pounds and then make a New Year's Resolution to lose it all. Ha! Didn't you do that last year?? Well, there's really NO EXCUSE when all it takes is 15 minutes to workout! Yep, 15 minutes!! Don't believe me?? Try it and I promise, you'll feel it, haha!! Click here for my Fit in 15 workouts!! You can also check Fit Mommies out while you're there!! Thousands have tried these videos and love them... stay tuned for testimonials!!! It's that time of year.... The time when we gain unwanted pounds and then hide it with baggy sweaters and stretchy leggings. On average, people gain 5-7lbs from Halloween to New Year's Day. We all get extra busy this time of year - workouts get tossed to the side... sometimes for months... We go to parties, eat too much, sit too much and sip on too many cocktails and pumpkin spice lattes! Yikes! DON'T GAIN THE WEIGHT THIS YEAR! Join my fit challenge and get IN shape this winter!! *If you are having any trouble with this link, try from a regular computer instead of your phone. If that still doesn't work, please contact me - girlsjustwannahavebuns@yahoo.com and we will get it sorted out, no problem! Introducing meat to your baby/toddler can be a little scary. I still worry about our son choking on meat and he's 2 and a half. 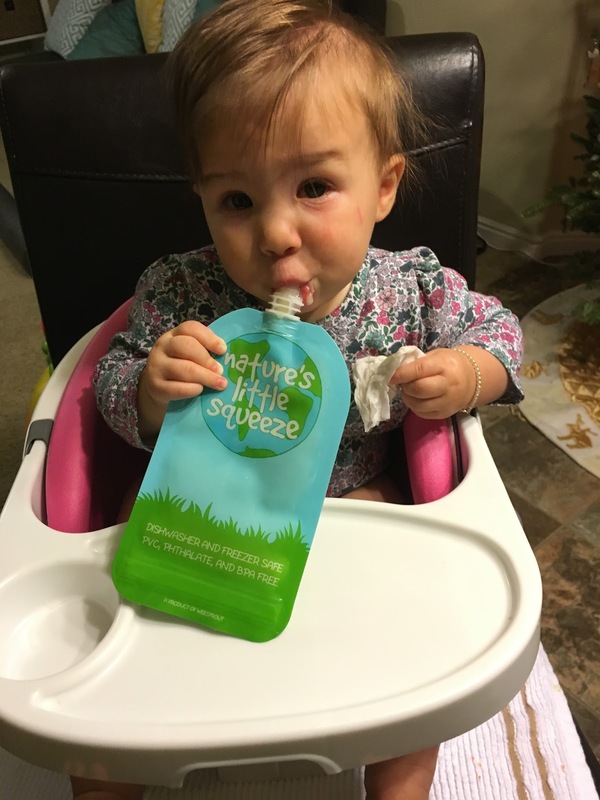 Fruits and veggie purees just seem so safe and easy, but there are a lot of great nutrients in meat and the different textures are also important for your child to get used to so they don't become picky eaters later. But how do you introduce it? Slowly, purely and somewhat bland. Offer small portions at first so their digestive tract can get used to it, buy organic and free-range, skip processed meats (hotdogs, sausage, chicken nuggets, fish sticks, fast food) and don't over season it. Of course you can buy baby food that has pureed meat mixed with veggies, but I personally have never fed my son anything that I wouldn't eat and that stuff makes me want to gag just looking at it. YUCK! A mistake I've made with our son is that I always seem to offer his meals as seperates - a protein, carb and veggie. The problem is... he doesn't like his foods mixed. He wants his meat in one place, his veggies on the other side and carbs seperate too. So, he won't eat a burrito. He won't eat sandwiches. He won't eat a hamburger (he eats the meat and will have some bread but doesn't like them together). If I give him a bite of chicken with a pea... he usually spits it out. He will eat the chicken and he will eat the peas but not in the same bite. Soooo.... I recommend mixing up how you serve things. Below I have given serving suggestions to help add variety. Have fun and enjoy the learning process with you and your little one! Oh... and don't give up if they don't like something the first time you try... give it 3-5 shots before accepting that they don't like it. Spray skillet with non-stick spray. Saute onion, if using. Add chicken and seasonings. Cook on medium until no longer pink. Add in spinach and cook on low until spinach is wilted. Spray skillet with non-stick spray. Saute onion for 5 minutes. Add in garlic and cook 2 minutes. Add meat and seasoning. Cook about 10 minutes until meat is no longer pink. Spray skillet with non-stick spray. Add onion & pepper and cook 5-7 minutes. Add meat and cook through (about 10 minutes on medium). In a large pot, combine all ingredients, including meat mixture. Cook on low for 30-60 minutes or on high for 10-15. When it comes to lunch, we often get stuck into eating the same things over and over... mainly because I'm so exhausted that I can't even think of what to make half of the time so when I find something Tilman likes, we just stick with it until he's sick of it. 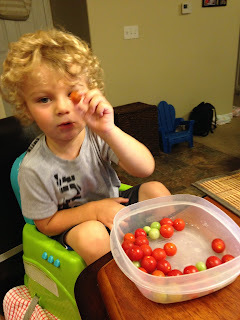 When we get fresh grape tomatoes, he eats them like they are candy with EVERY meal! Some of his favs are tomatoes & chicken, eggs cooked in coconut oil with Dave's Killer Bread on the side, a PB sandwich NO jelly!, soba noodles, smoked salmon with peas and hummus & cheese sandwiches. The other day, he came across a package of saltines in our cupboard. It was one of those little packages that come with soup when you eat out and it's been in our cupboard for months. Anyway, he really wanted to try them and he fell in love - haha... with saltines - yes. So, we went to Target on a mission to get some more. We ended up with the whole grain round ones and he liked those even more. 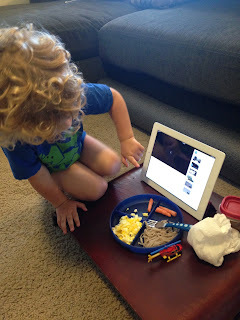 That's all he wanted to eat that day, so we turned them into a healthy lunch! 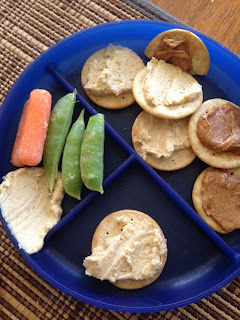 A few crackers smeared with organic PB and a few with my homemade classic hummus (recipe here), with a side of carrots & snap peas (he didn't like those) and my little boy was a happier... healthy dude!! Anyway, just because I wasn't going to the regular gym, that definitely didn't mean I wasn't going to workout anymore!!! Instead, we decided to bring the gym to us! We now have everything we need right in our garage - a squat rack w/ olympic bar & weights, free-weights ranging from 8-30lbs, a bench, medicine ball, stability ball, pull up bar (see previous post), bike trainer (turns a regular bike into a stationary bike) and a BOSU ball. I also use my stairs inside for cardio and use the great outdoors for running... and that's all I need! I often choose one or two pieces of equipment for the day and do everything with those. I find that the more simple, the better. I like supersets to save time and for a more intense workout. Surprisingly, when working out at home, I get a much better workout in less time! I've not only cut out the drive to the gym (15 minutes each way) and the daycare (now my babies are my workout partners)... but I cut out the walking from one machine to the next and the needless chit-chat with randoms that I'd rather not talk to anyway haha... I can do a full workout in a 6 foot X 6 foot space if needed and I get it done in 15-30 minutes a day! Here's how it's done.... Just pick the muscles you want to work (2-3 muscles) and pick a couple pieces of equipment... then get to work and don't stop until you are done! Below is my hamstring & abs workout with a stability ball... ENJOY! While this video is supposed to show you a couple new exercises to try out... It showed me that my pull-ups need work haha! Full-range of motion is always the goal... but it's not always the result LOL! In my defense, I shot this video AFTER an intense back workout so I was pretty pooped. Anyway, enough excuses... I will get better at these! Our pull-up bar is one of my favorite pieces of workout equipment! And working out my back is my second favorite muscle (hamstrings are my fav). So, I wanted to share with you a few of the exercises I love with the pull-up bar! Workout partners are great! They keep you motivated, committed and make the daunting task more enjoyable.... and I have the best little partner ever! It's my baby boy (toddler, really) Tilman - aka Tilmo, as he calls himself. Every morning after breakfast, me and "Tilmo" get our fitness on. Every day is a little something different... but we always include some mama/Til partner exercises where I use him as my weight. That might be Tilmo press (bench press), high-five crunches, bridge ups, weighted stair climbs (holding him as I climb)... or his new fav... dino chase - his dinosaurs scare me and I sprint up the stairs to get away. Do this 50 times and you'll be wishing the dino would just eat you haha! A couple of my favs are Tilmo squats and toddler press. Switch back and forth between these two exercises 5 times and mix in some crunches, that'll give you a full body workout in 10-15 minutes without leaving your house ... which can be quite a challenge with a toddler who strips his clothes off every time you're about to walk out the door haha! CLICK HERE for our workout today! We have (well, we HAD) an overflow of apples at our house! Like a MASSIVE amount! 38 to be exact!! You see, Grandpapa & Grammy have a farm. They have an amazing garden, too! I wish we lived closer so we could eat up all their fresh, natural goodies from the gound! They grow all kinds of fruits and veggies. Sometimes our little fam gets lucky and we benefit from their hard gardening work. This week, we got a big box packed with all different varieties of organic apples picked only a couple days before arriving at our doorstep. Yay!! Tilman kept saying "I'm so excited"!! So what to do with 38 apples? Hmmm... I mean, we could just eat them as is... and we have been doing that... but I like cooking and concocting, so I had a little fun. First, I made my signature GREEN APPLESAUCE - enough to last months and I froze it. This is just the first batch!! With more than 20 apples still left, I got creative - I love apple chips, so I made my own...YUM!!!! I said "YUM" right? Ha! So this is all we have left. Finally, I made some awesome apple peanut butter breakfast bars. Tilman is convinced that the nutrient-packed bars are a dessert cookie that he only can have if he eats all of his dinner haha!! 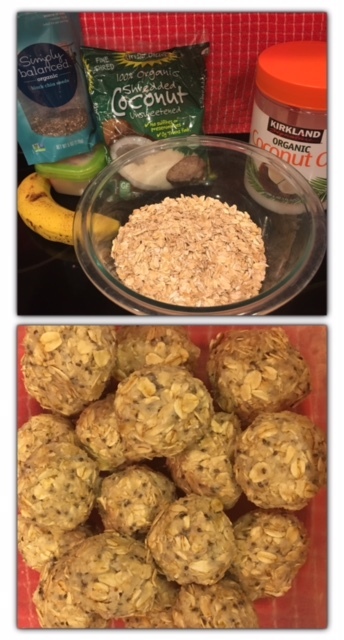 They are so healthy that I'd let him have them for dinner... but I'll let him keep thinking they're a sugary treat... haha... and there's no sugar in them! Preheat oven to 200. Line baking sheet with parchment paper. Lay apple slices on paper. Don't overlap. Sprinkle with cinnamon. Bake 3 hours, flip 1/2 way through. Turn oven off and leave slices in oven for an additional hour. Try these dipped in peanut butter!!! Combine all ingredients. Preheat oven to 350. Grease a 9x9 baking dish. Press mixture into dish. Bake 20-25 minutes into slightly golden at edges. I've decided to add a little something new to the blog! I'm going to be posting more videos of workouts & healthy foods. They'll be short.. just giving you my "Three Favs" - that might be my three favorite exercises for that day, week or month... or some of my favorite foods or recipes. Today... I'm bringing you my three favorite weight-free ab and booty exercises! Click the video and get working. As most of you know, I recently had my second baby. She's almost three months old and has changed so much. It's so exciting to see her sweet personality emerge and watch her developing an amazing zest for life... She's inspiring!!! Babies bring us so much joy (hence her name, Joyah) and wonder... but they also but our bodies through soooo much! We stress about them, we're sleep deprived, we're frustrated... oh and we are way heavier than ever before LOL! After 9 months of stretching and stretching and stretching some more... it takes time to get that pre-baby definition back in your mid-section. Some days I feel discouraged and wonder why it's taking so long, but then I remind myself it took 9 months to get so big, so it'll take a while to get tight again. All that said, I'm overall pretty happy with my shrinking belly and I wanted to share with you all (even though some pictures are pretty YIKES) my belly shrinking journey. This is crazy cause I actually thought my belly looked ok here!! Haha! Still have work to do, but I've come a long way! Don't Add Any Layers This Fall! Every spring, I get tons of new clients coming to me saying they gained too much weight during the fall and winter months. Cold weather, baggy clothes and yummy comfort food ... packing on the pounds is just so easy and easy to hide in the winter. But once the temps rise and you grab your favorite shorts and tank... you'll be sad to see they don't fit... 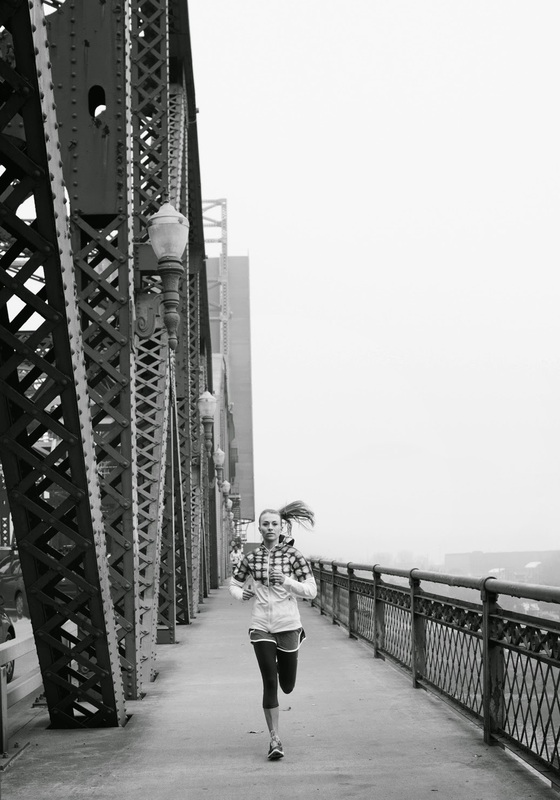 So this year, skip the bulking up phase and get fit in the cold! Last month my mom came out to visit. She stayed with us for a whole week! Some people might think EEEKKK, but not me... I was more like YAYYYYYY! You see, I've been blessed with a cool mom (and dad), I like hanging out with her! She's someone I'd choose as a friend even if she wasn't my mom. So maybe now you can understand my pure joy when she called to say she was coming to be with us! She's never stayed a whole week and she never stays with us in our house (her and my dad usually stay in a hotel). This trip was different and it was the best! I loved having her with us 24/7 and so did my babies! We went on adventures, shopping & just hung out! I got to cook for her and we even did some little workouts together (a first). My mom doesn't cook much, so I used the time together as an opportunity to show her some healthy, easy recipes. It also challenged me to try new things. One night, she said she'd like to try zucchini noodles (which you all know, I make A LOT), but all we had was ground chicken for our meat... so my mom said I should try to make chicken parm with zucchini noodles. I'd never done that and don't usually use ground chicken with marinara but WOW it turned out fantastic! It was super easy too... which is just what I need these days with my two little ones. Try this meal!!!! You'll love it! It now reminds me of that great week my mom spent with us! Saute onion & bell pepper 5-7 minutes. Add in garlic and stir. Now, put in the chicken and seasonings. Once chicken is cooked, add sauce and reduce to low heat. Cover. 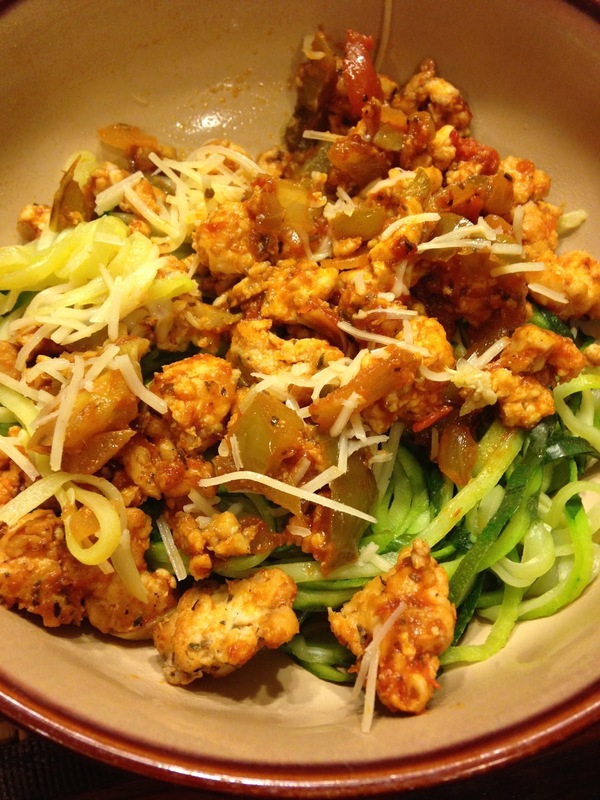 Use a zoodle maker to turn your zucchini into noodles. Steam 5-7 minutes. 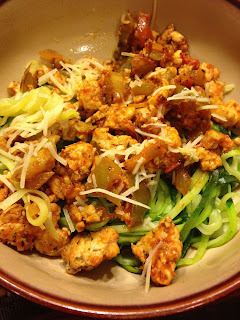 Top cooked zoodles w/ chicken mixture and sprinkle on a little parm. ENJOY! Anyway, I've learned to adapt and fit in a workout despite most obstacles. I'll wake early, stay up late, etc.. I get it done. This is not to brag, but to inspire and show you that it might be hard, but you can squeeze it in. I find that many times, my modified, squeezed-in workouts are better than the planned out, routine ones! Since having children, this has become more true than ever before. I don't have a routine! Routine for me is doing whatever my babies need me to do - that can change from one second to the next. Working out with a wild toddler and a newborn is hard, but it's an important part of my day because it's the only 15-30 minutes that I have to work on me... this doesn't mean it's time to myself cause my workouts are rarely done alone - Tilman is usually my weight for squats, lunges and shoulder press haha! Or he's my motivator telling me to hurry up and finish so we can play trucks - making me run faster or do burpees at an insane speed. Every day and every workout is different. It all depends on my baby's moods... and I love that! It keeps things interesting and it keeps my body guessing. Anyway... they say different is good...I'd say different is great! *Simply run up and down your staircase 50 times! Finish with 100 crunches. - Perfect for nap time or have your toddler ahng with you and cheer you on. Til loves this and tells me to do more haha! Holding your toddler....but BE SAFE! As a mom of two, my days are spent feeding baby, potty training Tilman, feeding baby more, changing diapers, going crazy, playing trucks, cleaning up the trucks, finding trucks in my water cup, protecting baby from trucks flying at her head, feeding... ok, you get it!!! Busy!!! So lately, my neighbors and my hubby have been doing the cooking for me... score!! Yesterday, my sweet neighbors brought us a lifetime supply of zucchini... haha! I LOVE zucchini and wanted to make something new with my delicious gifts. I decided to try out mini zucchini crust pizza things ;-) We had some ground buffalo in the freezer and my favorite marinara from Trader Joe's (super low in sugar), so I got to work!! While my baby girl, Joyah, napped and my wild boy, Tilman, played in the backyard, I fired up the grill and began my adventure. Slice zucchini into thick rounds. Sprinkle with sea salt, basil & oregano. Grill on medium for 7-8 minutes on one side. Let cool. Top grilled side with sauce, toppings (buffalo for us) and cheese. Grill an additional 7-8 minutes. Enjoy! I hate when I'm rolling tortillas for enchiladas or burritos and they crack! Ugh! So annoying... and just as annoying when trying to make crunchy rolled tacos! On Pinterest, all of the flauta recipes I saw came along with pictures of beautiful tortillas in wonderful shape - no cracks! Mine, not so much... But the good news is, they tasted so good no one noticed my messy rolling. I used ground buffalo for this batch and it was a great choice. My family is big on buffalo! It's lean, high in protein and the kind I buy is all-natural, horomone-free! As with most of my recipes, you can change it up to fit your needs. Try beans & rice or cheese, ground chicken, shredded chicken and cheese, beef, etc. Make it your own! They aren't Pinterest pretty, but they are pretty awesome! Saute onion and bell pepper in a skillet for 5-7 minutes, until soft. Add meat and seasonings (not cilantro). Cook until meat is no longer pink. Set aside to cool and add cilantro. Heat tortillas in microwave for about 30 seconds so they are soft and are less likely to rip (mine still did haha). I've been wanting to make some type of stuffed chicken for a while... If you're a regular here on my blog, you know I really like stuffed stuff haha! Stuffed peppers, mushrooms, zucchini boats, stuffed pitas... if it's stuffed, I want it! SO tonight was the night that I finally tried stuffed chicken! Wow... I was blown away! You can make any variation of stuffed chicken to fit your tastebuds.. that's the beauty of this meal - make it once a week and it can be totally different everytime. Next, I want to try pepperjack cheese, green chilies and cilantro .... ooooh! Carefully fillet chicken in half to make thinner. Sprinkle with salt, pepper and oregano. Place basil, cheese and a few strips of bell pepper in the center. Roll breasts and secure with 1 or 2 toothpicks. Grill on medium for 7 minutes, flip and grill another 7 minutes or until cooked through. I drizzled a little balsamic vinegar on mine before eating - must try!!! On Memorial Day, it just seems right to fire up the grill and enjoy some great food with family... So while you're at it, why not prep for the week ahead to make sure your clean eating is a success? Everytime my hubby and I grill, we throw on some extra meat and veggies to save for days to come. This time we made chicken breasts (seasoned with sea salt, pepper & basil), tomatoes (seasoned with sea salt, oregano & a drizzle of olive oil) and chicken thighs marinated in jerk seasoning. We also grilled a head of cabbage (cut into quarters, drizzled with olive oil & lemon, sprinkle with pepper). All the food was done in 30 minutes and now we have meals all ready for us for the next several days. I like the breasts on grilled cabbage salads with mozzarella, grilled tomatoes and balsamic. With the jerk thighs, we add some brown basmatic rice and steamed broccoli. Both meals are delish, simple and super clean! So go for it... get your meal prep done while hanging with the family! 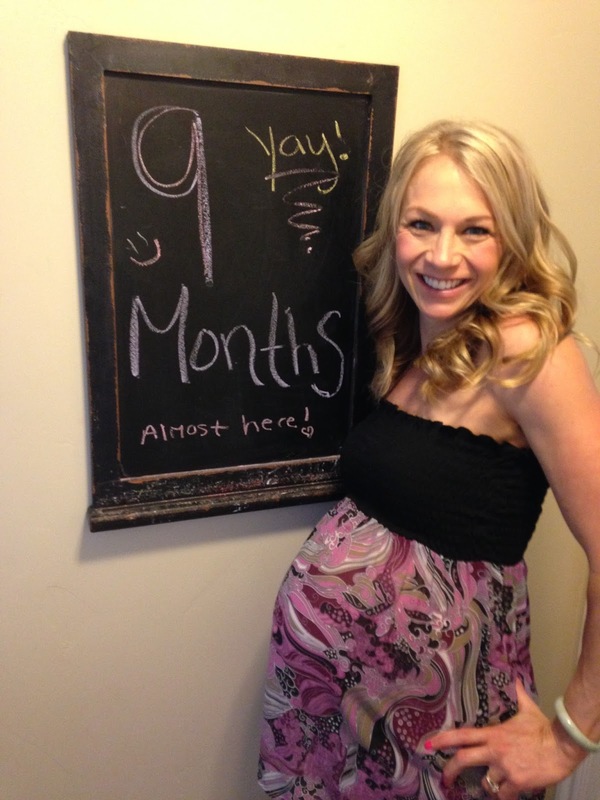 Pregnancy isn't a "get-out-of-gym-free" pass... In fact, if you're expecting, working out is more important than ever - for you and your bundle of joy. *All pregnant women should check with their doctor before working out. 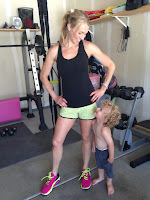 .... OR check out my FIT MOMMIES SERIES ;-) CLICK HERE! These new workout videos are for mommies of all kinds, whether you're expecting your first child, your 10th, your children are all grown up or you're just getting back to exercising after having a baby... you can benefit from these workouts. If you'd like a personalized workout and/or diet plan at any stage of your life, be sure to email me at girlsjustwannahavebuns@yahoo.com!! I work with women who are trying to conceive, pregnant, postpartum and beyond! Hope to talk with you soon! 8 MONTHS PREGNANT W BABY 2 & STILL WORKING OUT AND FEELING GOOD! Are you having a hard time getting your kiddos to eat their veggies? Well, don't let them win! They need the nutritents from greens and it's your job to get them to eat healthy... BUT, I'm not saying they have to know they're eating veggies ;-) haha! Fortunately, our son really like vegetables and I am certain it's because he's been fed them from the start. I didn't give him tons of options, I just gave him what I knew he needed. This is not to say that he likes all veggies: he hates potatoes of any kind and green beans, but he loves peas, broccoli, asaparagus, beets (we gave him raw beets while teething when he was just 6 months old) and carrots (raw not cooked). 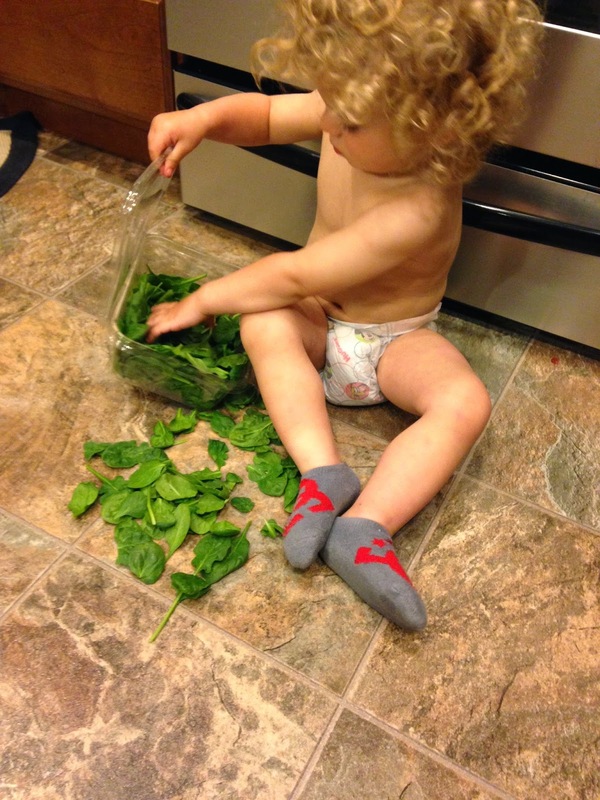 I still can't get him to eat spinach (despite this picture... He thinks it's great to play with but not so much to eat).... So, I just steam it and blend with his apples. He LOVES his cinnamon applesauce ....with hidden spinach ;-) and I love watching him eat it, knowing he's getting a power-packed snack. I often mix this in his oatmeal or plain Greek yogurt for breakfast and it's a hit! Clean, peel and cube apples. Steam for about 10 minutes. Add in a handful or two of spinach and/or kale. Steam an additional 5-7 minutes until greens are wilted and apples are slightly soft. Let cool. Blend. You can add some cinnamon, too! Make a bunch and freeze! I was running short on time today so had to do a quick workout. I seriously feel like my shorter workouts are often better than when I drag them out. I usually still managed to cram in all the things I normally do, but I literally run from one thing to the next. Often times, we tend to just skip workouts when we only have 15 or 20 minutes, but that's almost never the right choice. Today, I decided to skip a shower instead of skipping my workout - lol. Gross? 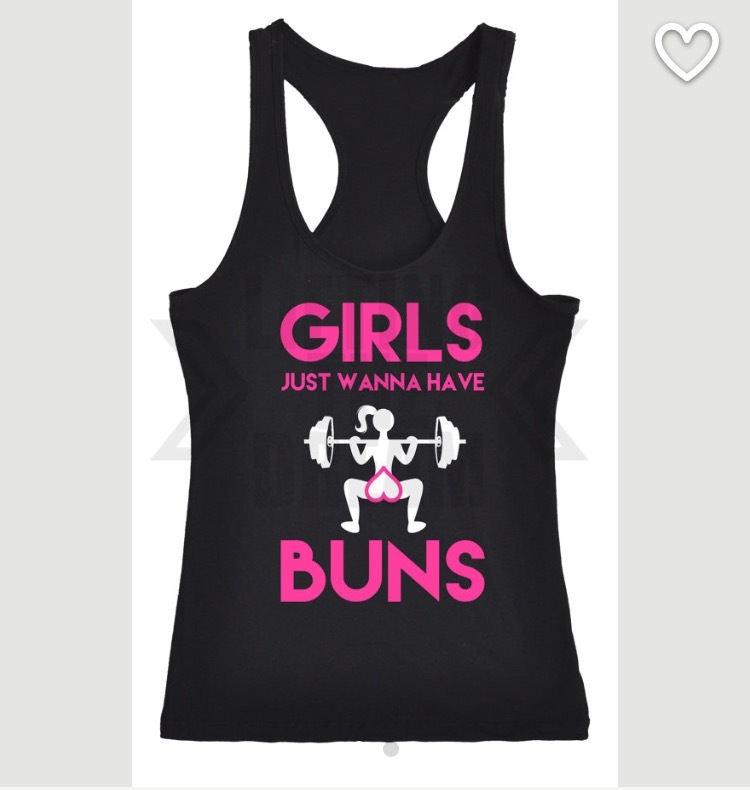 Maybe, but I don't feel gross ;-) I feel fit and accomplished. The shower will wait until tonight... It takes much less motivation for that than a workout. For me, waiting until the evening to workout is no good. I think about it all day long and then often feel like just putting it off until the next day. I am definitely a morning exerciser! *Finish with 100 donkey kicks on each leg. You can switch back and forth between the legs until you reach 100 on each. I love salads! I could eat them every night for dinner... but I don't cause my family would find a new mama... lol. I know most people think "diet" when you mention salad, but if you do it right, it doesn't taste "diety" at all! I pack my salads tall and wide!! I seriously throw on all the veggies I can find in the fridge and add extra protein to make them more filling. Check out this beauty... Well, the eggs are sliced messy but I still find it lovely ;-) And it tasted AWESOME! Here, I had made a bunch of grilled chicken breasts earlier in the week. We used them for sandwiches (add green chilies a slice of cheese & spinach), with brown rice & veggies and for salads. 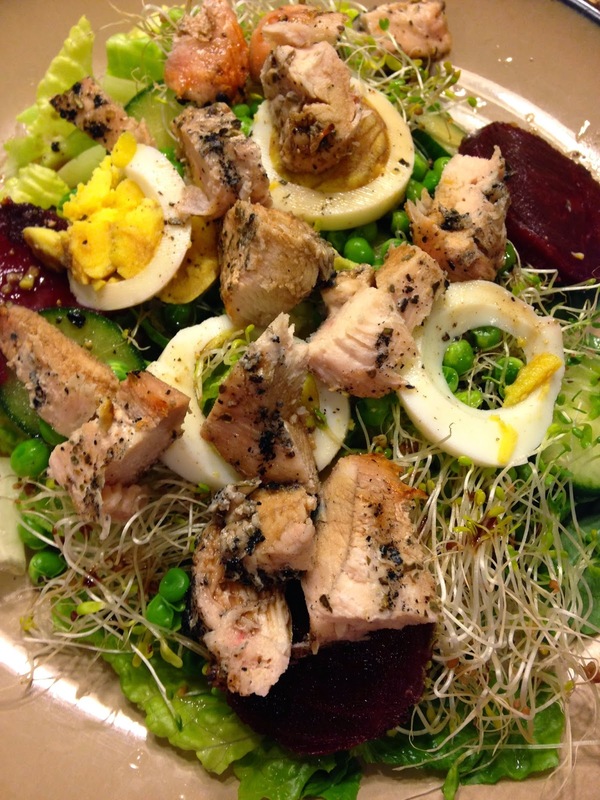 This one had romaine lettuce, peas, jicama, sprouts, beets (my fav! ), cucumber, avocado, chicken of course & a hard-boiled egg. I almost always use balsamic vinegar as my dressing, unless I'm making a Mexican-style salad, then I adore Taco Bell hot sauce as dressing lol!! The key to not getting sick of salads is to mix it up. Add different toppings each time - nuts, seeds, grilled veggies, cottage cheese, mozzarella, steak, garbanzo beans, a squeeze of lemon, a few corn chips and beans, etc... Get creative! Share your own masterpiece below! Give it a try! Make a huge power salad for dinner this week! You'll feel light yet satisfied!